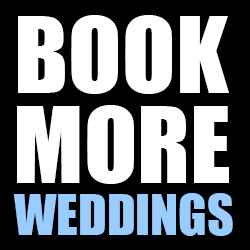 Thanks for requesting a trial subscription to my Book More Weddings Tip of the Day. Watch for it in your inbox (I’ve already sent you issue #1). If you don’t see it shortly, check your spam or junk email box. Some subscribers have told me it gets caught there. You’ll receive four more issues over the next several days. At the end of your trial I’ll send along information about continuing your subscription if you’d like to. I always welcome your feedback, suggestions for future tips of the day, as well as questions or requests for clarification. Simply reply to any message. I’ll follow-up with you as quickly as I can.